I love a good take-away, I mean come on, can you really beat stuffing your face in your pjs on the couch? 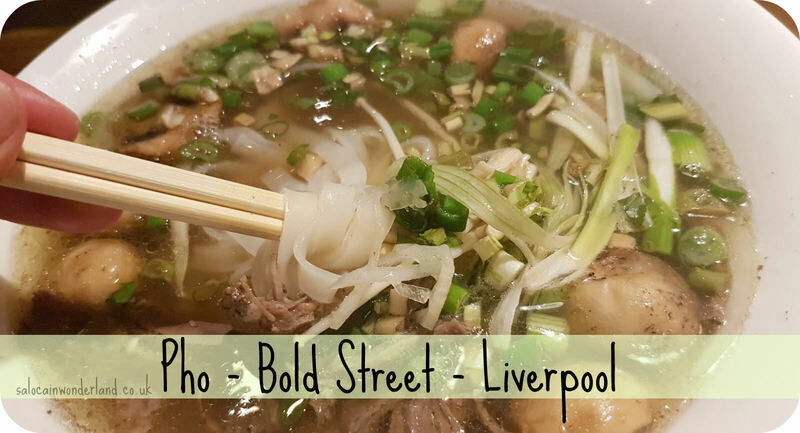 There are some meals though, that are worth putting actual pants on for, and heading up Bold Street to check out Pho is one of them! I love Bold Street more than any other street in Liverpool. Nowhere else can you taste your way around the world, from Indian classics, Lebanese shwarma, Japanese delicacies, good ol’ fish and chips and now, authentic Vietnamese cuisine. Pho has finally come to Liverpool and its PHO-king (come on, I had to use that one!) amazing. I headed down for a little weekend date with the Mr to check out what they had to offer, it had been a manic week at work and we deserved a treat. I’ve taken to treating myself with meals or experiences over things of late, I’m feeling surrounded by stuff and it’s really starting to bother me - hello mid-life crisis? But more on that another post! 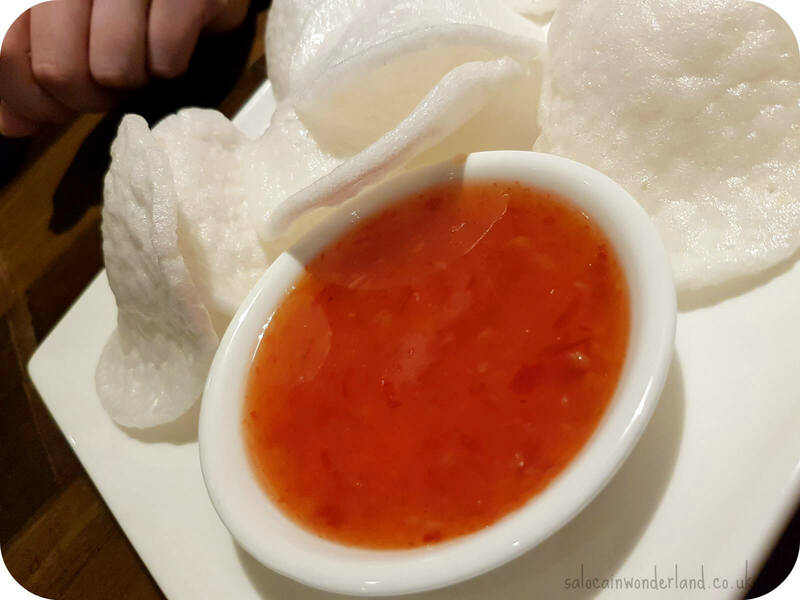 While we oogled the menu we munched on seriously good prawn crackers with sweet chili dipping sauce. These where so light, airy and not greasy, much better than the ones I usually grab from the takeaway! I sipped at my phojito which was super refreshing after finally making a decision on the menu - they have so much to offer it wasn’t easy to decide! Starters, for me, are the best part of every meal, so we picked two, blog justified indulgence for the win! 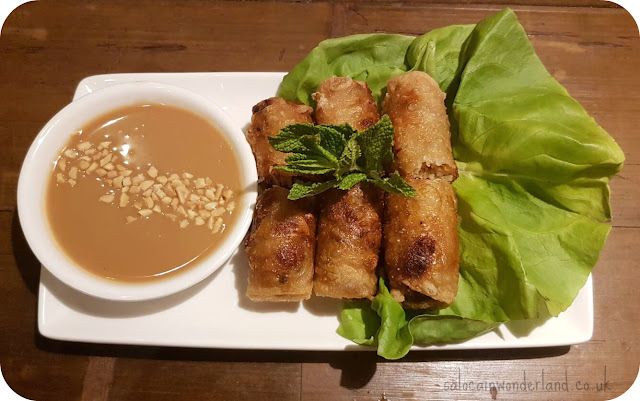 Cha Gio was my choice, extra crispy spring rolls filled with pork and veggies, served with a peanut sauce, lettuce and mint. They were so crispy and well cooked and, at our servers suggestion, I wrapped each one in a little mint and lettuce which really changed up the taste! The peanut sauce was just, OH, I really wanted to take the left over sauce home, it was just that good! 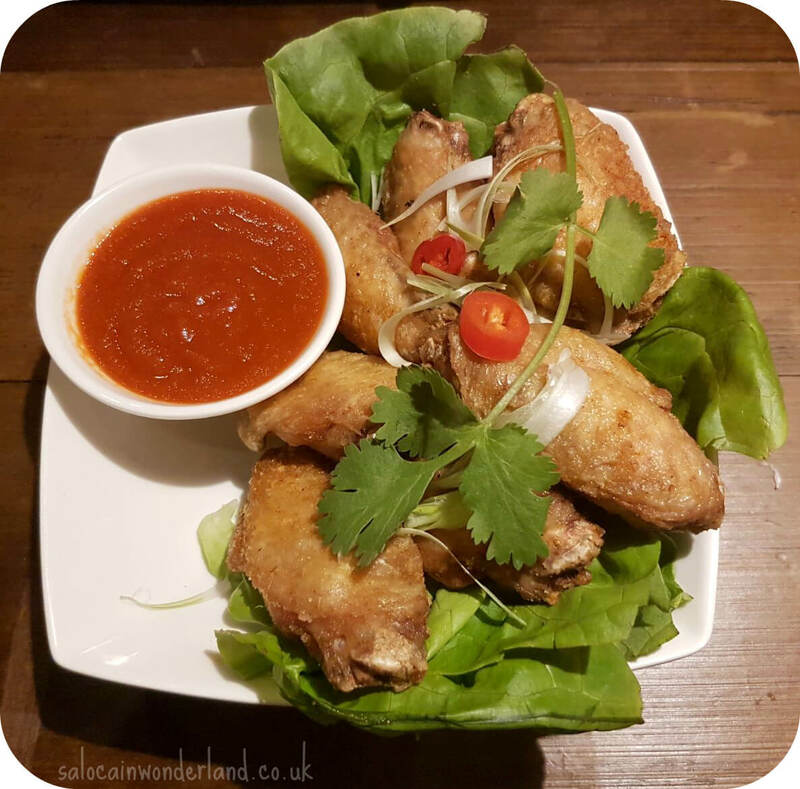 The Mr picked Canh Ga - seasoned, crispy skinned chicken wings with sriracha sauce. These starters must be designed to share as both were huge, we must have had about 10 chicken wings on the plate! They were so well cooked and with a couple of quick twists, the bones came right out! We devoured everything. The srirachi made me feel a little like we were on First we Feast! Onto the mains, and I just had to try a house special. 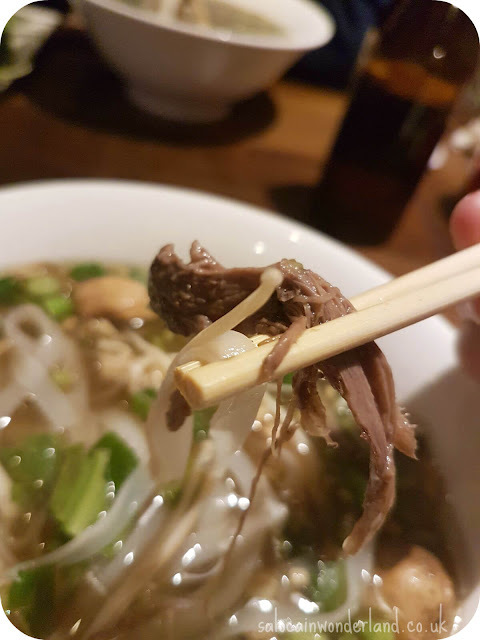 Pho, if you don’t know, is the traditional dish of Vietnam. A rice noodle soup served with fresh herbs on the side. 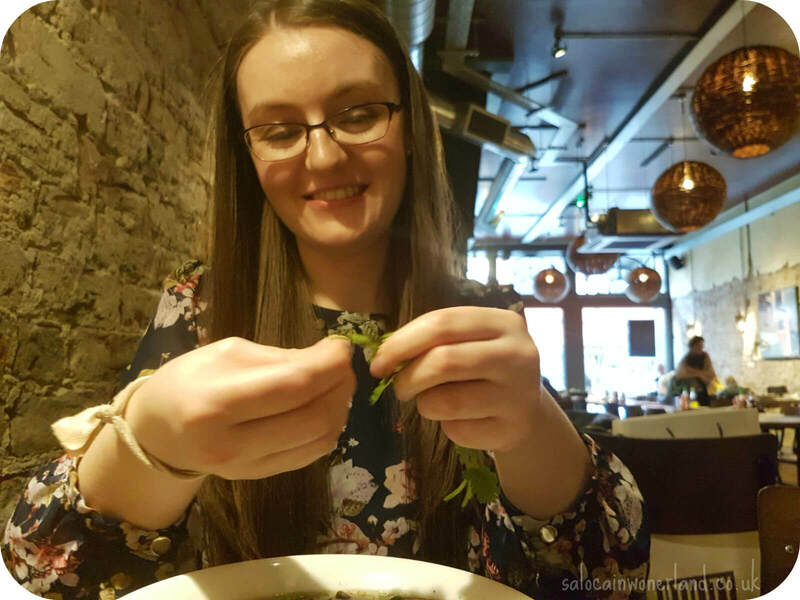 The herbs and sauces are a key element to the whole dish, as they allow you totally customise your soup. I went for the Pho Bo Nam Tung, slow cooked beef brisket, enoki, button mushrooms and a creamy egg yolk in a rich, 12 hour simmered broth. I chucked in tons of herbs, a little lime and a tiny bit of chilli to really help bring out the flavours. It was delicious. It was like a hug with every mouthful, seriously comforting and tasty. Mr went for a simple Pho Chin, tender beef brisket in a rich beef broth. He went all out with the herbs and chilli which really kicked up it up a notch. Now, in the interest of blogging and really putting myself out there to give you guys a full run down of my Pho experience - I had to order a dessert. It would have been rude not to try just one. 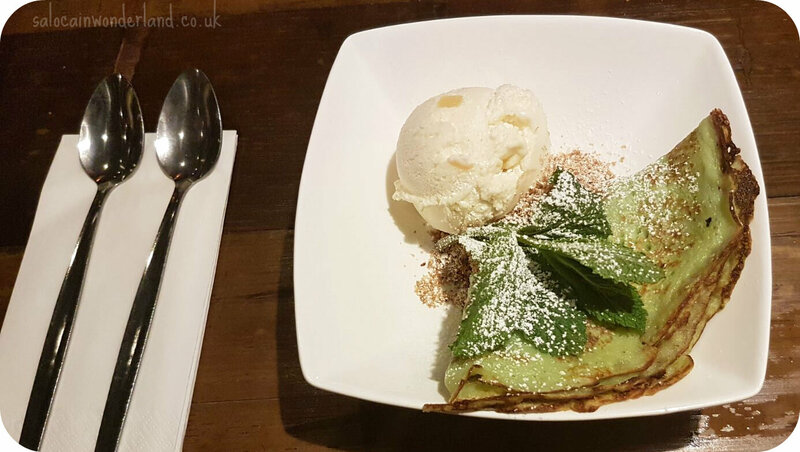 I couldn't resist the Banh La Dua, a pandan pancake with rosted coconut and a side of honey and ginger ice cream. 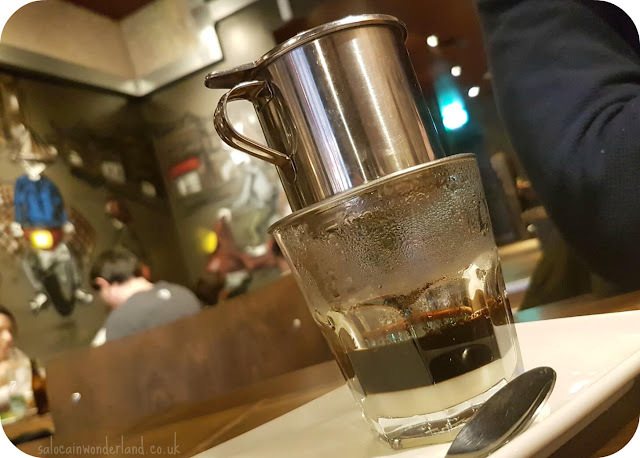 Mr, not being a dessert man, went for a traditional Ca Phe, a rich vietnamese coffee. The pancake was unreal. It was somewhere between a pancake and a crepe and the toasted coconut just set everything off perfectly. The ice cream had chunks of crystallised ginger in too which was just delicious. To say I had to fight for a bite would be an understatement! The Mr went all out on this one, for a non-dessert guy he was temporarily converted over to the sweet side! If you're looking for a laid back atmosphere, friendly, funny and helpful staff, and just downright good comfort food, look no further than Pho! 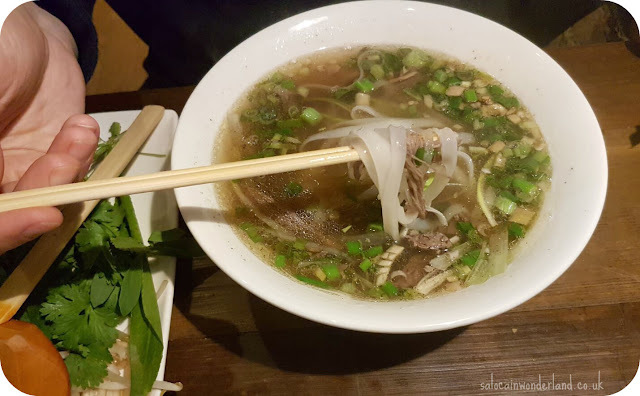 There is so much on the menu that I want to go back and try, especially the rice dishes and some more steaming Pho bowls! 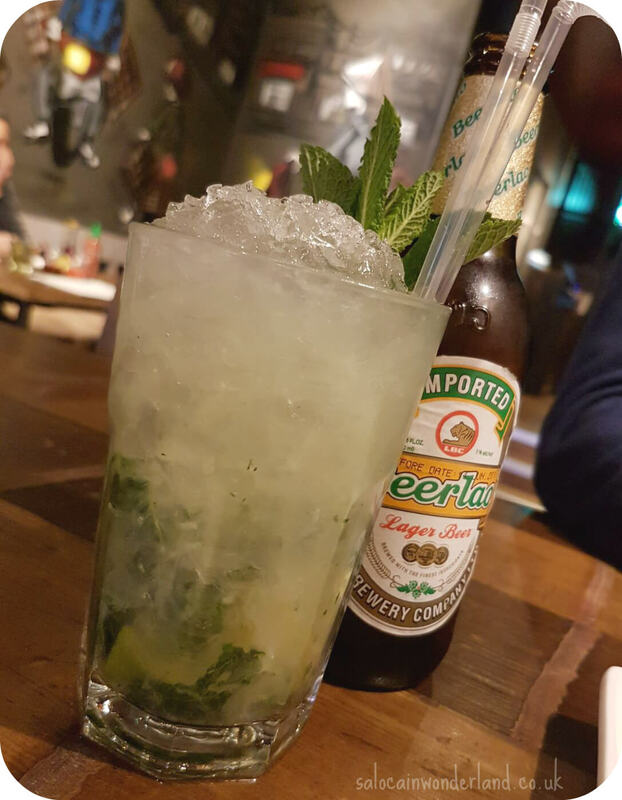 After a long, hard week, it really chilled us out and gave our tastebuds a right treat! Meal kindly provided by Pho. All thoughts and opinions are 110% my own. For more information, see my disclaimer policy here. It looks lovely! I always pick spring rolls. THE BEST. I love noodle soup type dishes. There's a few places in Leeds that do some lovely food like this - more reason for you to come and VISIT.